First editions of Alexander Pope’s monumental illustrated translations of Homer’s Iliad and Odyssey. Quarto, 11 volumes. 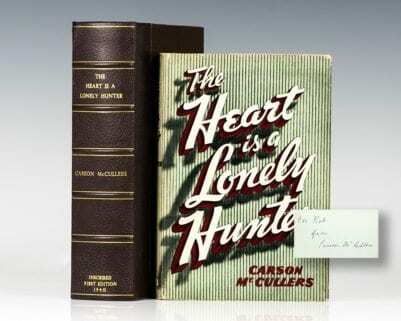 Uniformly bound in full contemporary calf, gilt tooling to the spine with red morocco labels. Some rubbing to the spine and extremities, a very good set overall, scarce and desirable in contemporary calf. The subscribers list for the Iliad lists 575 subscribers, including Addison, Congreve, Newton, Steele and others; that for The Odyssey are 610 (including those in the supplementary list appended to the final volume). For the Odyssey, Pope was assisted by Elijah Fenton and William Broome, and pencil notes in the texts identify the responsible party for the specific Books and Notes. That those pencil annotations and incidental others in pencil in the same hand scattered elsewhere are Hobhouse's seems probable, as a pencil note in a quite similar (or same) hand appears at the conclusion of the Postscript to the final volume (14 Dec. 1843 J.H. ), suggesting either the date of his acquisition of the set, or more likely, his completion of reading. Editions in folio (large and small) to benefit the publisher followed the appearance of each new volume in a timely fashion, the proceeds from Subscriber's quarto edition having been Pope's exclusively. 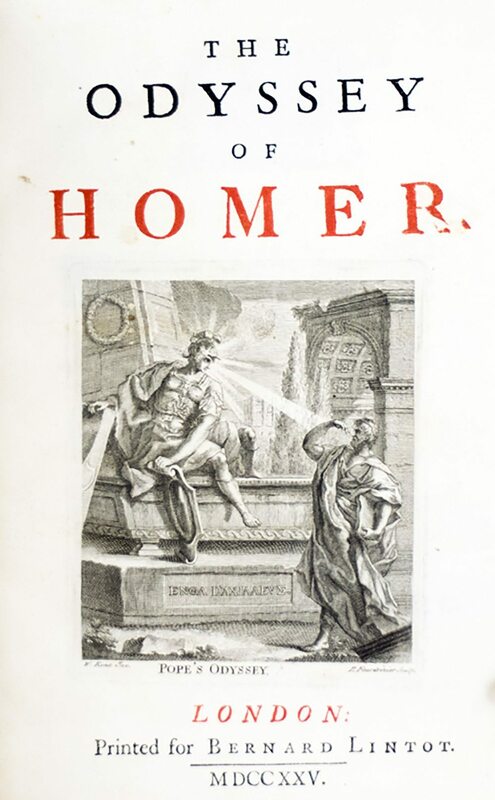 Encouraged by Swift, Addison and Steele, among others, Pope began translating Homer in 1713. The arduous undertaking would prove to be the most laborious literary enterprise of his life, but one to which he was well-suited. "Idolatry of classical models was an essential part of the religion of men of letters of the day But a Homer in modern English was still wanting. Popes rising fame and his familiarity with the literary and social leaders made him the man for the opportunity The Homer was long regarded as a masterpiece, and for a century was the source from which clever schoolboys like Byron learnt that Homer was not a mere instrument of torture invented by their masters. No translation of profane literature has ever occupied such a position" (DNB). 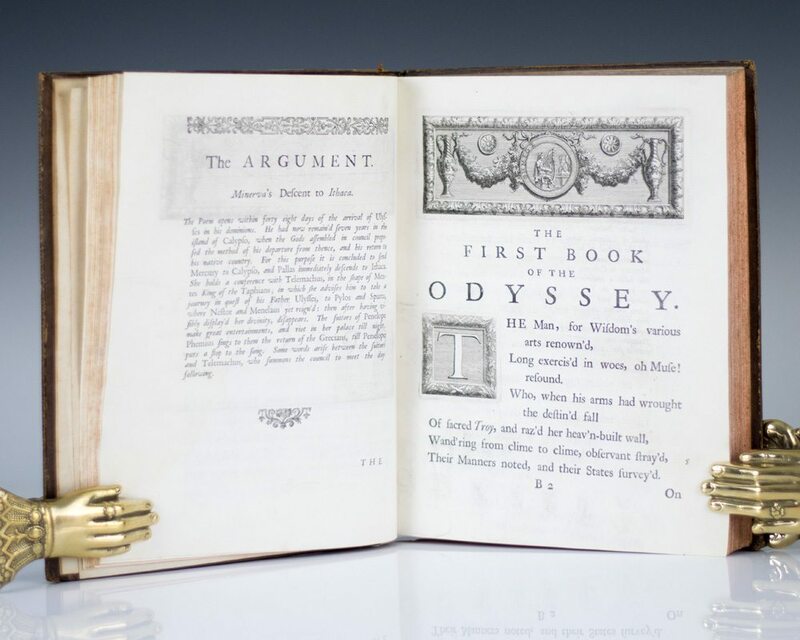 First editions of Alexander Pope’s monumental illustrated translations of Homer’s Iliad and Odyssey. Quarto, Subscribers edition. 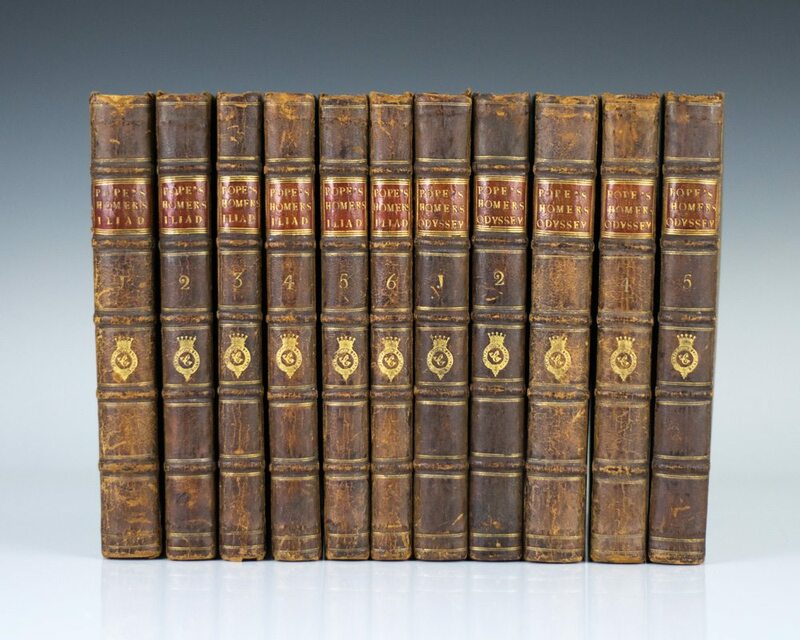 11 volumes, uniformly bound in contemporary calf, gilt titles to the spine and corner ornaments, rebacked to style in brown calf, raised bands. The bookplate in each volume of Sir John C. Hobhouse. Hobhouse (1786-1869), was Lord Byron’s close friend, literary confidante and executor. Frontispiece portrait in first volume of each work, engraved title vignette in second, folding map and folding view of the Siege of Troy, engraved head and tail pieces, decorated initials. Light foxing, tanning and offsetting in first four volumes of The Iliad, which is often encountered. The Odyssey, apart from some occasional marginal dusting, is generally crisp and fresh. Laid in is a one page a.n.s., undated, to Hobhouse, endeavoring to arrange a meeting, signatory illegible. A nice set of first editions with notable provenance. 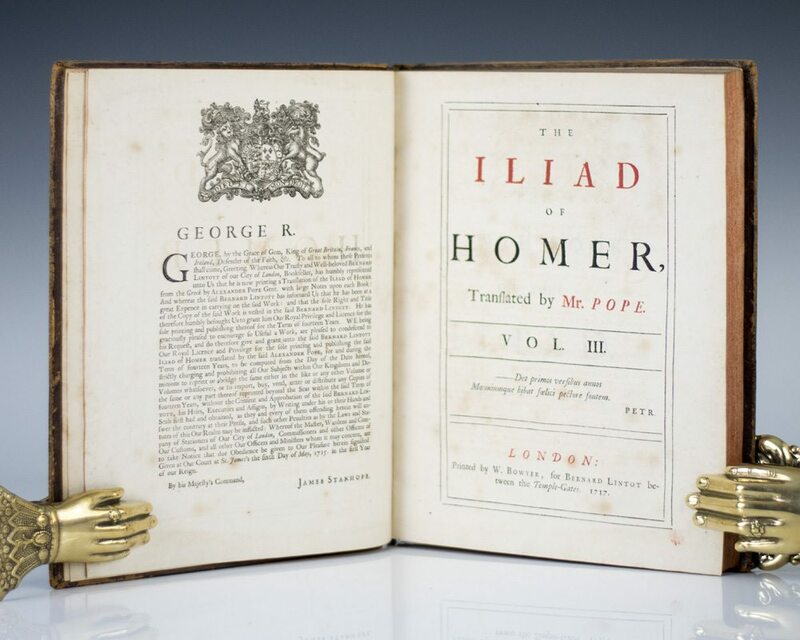 First edition of Alexander Pope’s monumental illustrated translation of Homer’s Iliad, the suscription edition. 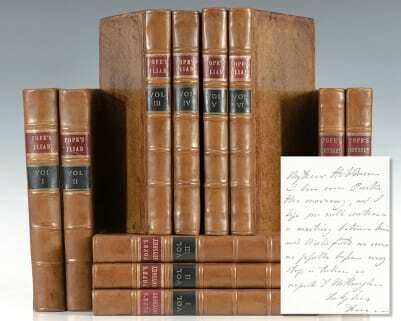 Quarto, 6 volumes, uniformly bound in contemporary calf, with gilt titles to the spine and corner ornaments, rebacked to style in brown calf, raised bands. The bookplate in each volume of Sir John C. Hobhouse. John Cam Hobhouse (1786-1869), was Lord Byron’s close friend, literary confidante and executor. 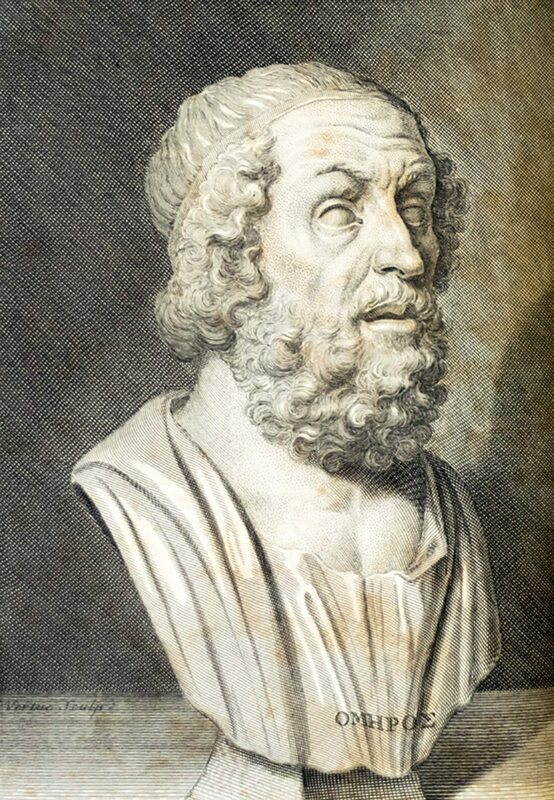 Frontispiece portrait of Homer. In very good condition with some of the usual toning. An attractive set.